Australia's Tasmanian devil, the world's largest surviving marsupial carnivore, will be listed as endangered because of a contagious and deadly cancer, the government said. 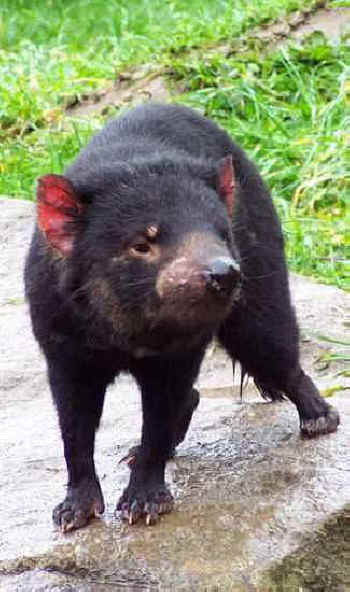 "This disease has led to the decline of about 70 percent of the Tasmanian devil population since the disease was first reported in 1996," Environment Minister Peter Garrett said in a statement. Devil facial tumor disease, which is spread through biting, kills the animals usually within three months by growing over their faces and mouths, preventing them from eating. Early European settlers named the feisty marsupial the devil for its spine-chilling screeches, dark appearance and reputed bad temper which, along with its steel trap jaw, made it appear incredibly fierce. The animals were previously listed as vulnerable, and Garrett said the change in status to endangered would give them greater protection under national environment law. "Fortunately, strong action is being taken to find out more about this disease and to stop its spread," he said. The government had committed 10 million dollars (7.5 million US) over five years to a program aimed at saving the devil, including research into the disease and support for captive and wild populations, he said. The species is restricted to the island state of Tasmania after competition from the dingo led to its extinction on mainland Australia. It is Australia's largest marsupial carnivore after the extinction last century of its distant cousin, the thylacine or Tasmanian tiger.